We just got this bouncy castle in and we started getting requests for it right away. A mom called us up to ask if we had it available for a birthday party this weekend. Since we just got it in we didn’t have time to put in our system so we booked her right in. Once we arrive and the kids saw the Mickey mouse ears they all giggled and tried to jump in right away. The colors on this bouncy castle are bright and vibrant and becomes the life of the party. Mickey, Minnie and their friends are digitally display in front of the bouncy castle and invite everyone into the Mickey Mouse Club House! This beautiful bouncy house rental features Mickey, Minnie Mouse, Goofy, Daisy, and the Mickey Mouse’s best doggy pal, Pluto. These characters have always been a favorite with toddlers and kid’s of all ages. This bouncy house is great for birthday parties, communions and any Disney or Mickey Mouse themed kid’s event. 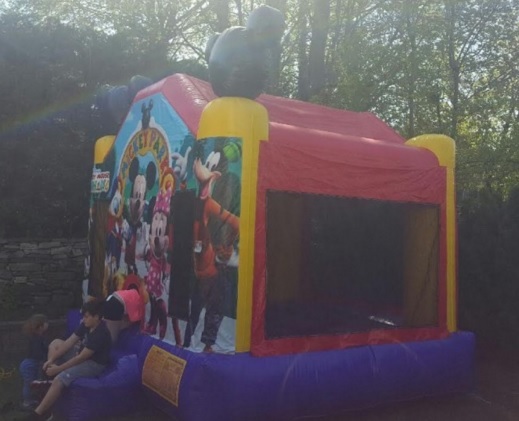 This bouncy was setup in New Rochelle, NY this past weekend and the kid’s love it. We deliver to all of Westchester County, NY including White Plains, Yonkers, Scarsdale, Eastchester, Sleepy Hollow, Ossining and all surrounding areas. We don’t just have Mickey Mouse, we have several bouncy castles and party rentals to choose from. Give us a call at: 914-481-2686 or reserve this bouncy castle online now using our reservation system.